PASADENA, Calif. — The biggest obstacle in deflecting a killer asteroid away from Earth may be humanity's inability to get along. We already have the technological know-how to prevent dangerous space rocks from barreling into our planet, provided we detect them in time. But this vital job would require a great deal of international cooperation, experts say, and history has shown that working together is not our species' strong suit. 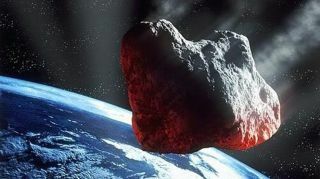 "Somebody's got to make the decision to actually mount the deflection, and do it," said former astronaut Rusty Schweickart, chairman of the B612 Foundation, a group dedicated to predicting and preventing catastrophic asteroid impacts on Earth. Our planet has always been pummeled by space rocks. A 6-mile (10-kilometer) asteroid slammed into Earth 65 million years ago, for example, wiping out the dinosaurs. A potentially civilization-ending asteroid will bear down on Earth at some point, panelists stressed. It's a question of when, not if — and it could happen uncomfortably soon, they said. While the dinosaurs were helpless victims of this death from the sky, 21st-century humans don't have to be. "What's cool is, we can do something about it," said panelist Bill Nye, executive director of the Planetary Society and former host of the science-themed TV show "Bill Nye the Science Guy." Humanity has the technical skills to move asteroids in several different ways, panelists said. We can hurl a large body into them, for example, changing their orbit with one dramatic impact. NASA did just that in 2005, sending a small probe careening into the comet Tempel 1 to determine the icy wanderer's composition. The goal in that case was science rather than planetary defense, but the key is that humanity knows how to do it with today's technology. Asteroid deflection could also work in more subtle ways. Scientists could sidle an unmanned spacecraft up next to a potentially dangerous asteroid, then let the duo cruise through space together for months or years. Over time, the probe's modest gravity would tug the asteroid into a different, more benign orbit, Schweickart said. This so-called "gravity tractor" technique would allow for precise deflection, making it perhaps the most attractive option, provided we have enough lead time. Scientists know how to do this, too. Various robotic missions have met up with asteroids over the years, with some even landing on or touching the space rocks. Japan's Hayabusa spacecraft even plucked some pieces off one in 2005, then sent the samples back to Earth for analysis. If we didn't have very much warning time, and if the threatening space rock was too big to just knock around with an impactor, we could try to blast it apart with a nuclear missile. But this option should only be employed as a last resort, as it may end up doing more harm than good, panelists said. A potential asteroid strike would represent a global problem that the world would most likely have to tackle together, Schweickart said. Cost is one issue that would bring nations together, though likely not the main one. A deflection mission might cost $500 million to $1 billion, Schweickart estimated. So it wouldn't exactly break the bank of the United States or another world power, but fairness would still seem to dictate that the costs be shared. But many countries would want to be involved to make sure their own voices were being heard, and their own interests were being protected. Say, for example, that an asteroid appeared to be headed for impact in the north Atlantic Ocean. Russia or China might push for a plan to nudge the asteroid to the west, away from them. The goal, of course, would still be to divert the asteroid away from Earth entirely — but Asia might be spared if the mission moved the asteroid a little, but not enough. "That's why this geopolitical issue is very, very sticky," Schweickart said. "We've got to have agreement between nations." Such agreement might be tough to come by, especially since an effective deflection mission would have to be initiated early to have the best chance of success. We'd need lots of lead time, for example, to launch a gravity tractor spacecraft and give it time to tug on the asteroid. In fact, we'd have to launch the mission before we were absolutely sure that the space rock in question was actually going to strike Earth, according to Schweickart. "If you wait until you know, it's too late to act," he said. Schweickart is pushing hard to raise awareness of the asteroid threat, and to convince people of the need to plan accordingly. He's afraid that the world will have a hard time pulling the trigger on a potentially civilization-saving mission. "The likelihood is, we're going to end up with a big international debate until the day it hits," Schweickart said. "That's the most likely scenario."